The French Telecoms Federation is launching a practical guide for parents to support and protect their children online. Parental controls, private lives, online shopping, cyberbullying, “fake news”… Discover our tips. Thanks to digital tools and the internet, your child can access a host of content allowing them to communicate, learn, develop and have fun. Children may also be confronted with unsuitable, shocking or degrading content, and also pu themselves at risk. First and foremost, it is up to parents to educate their children first and foremost. They have an essential role in preventing risks and helping their children to become independent. Therefore, it is essential to discuss matters with your child regularly in order for them to remain vigilant. Simple measures may also be taken to better supervise their use of the internet and help them to become more proficient in the digital world. By way of support, telecoms operators have taken special action and put in place specific tools, such as guides, partnerships and more. Childcare and child protection organisations, consisting of family and other associations, experts and institutions, are also available to provide guidance. 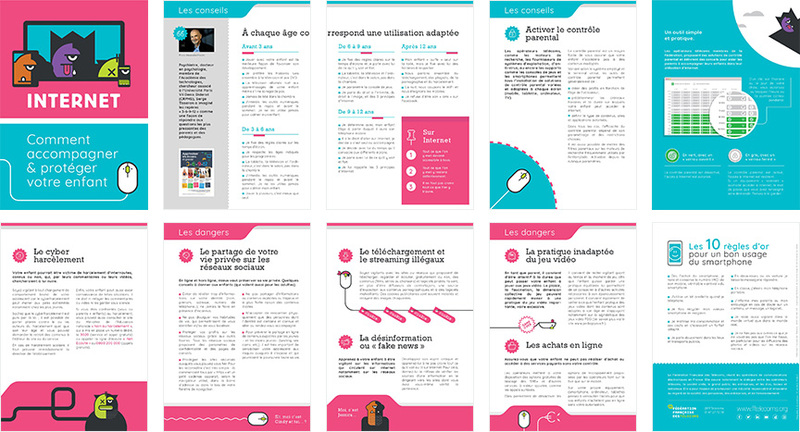 Guide "Internet : comment accompagner et protéger votre enfant"